Is a house, and as Riot stacks it does not become a dead draw later on. Solid T3 play IMO, although rather weird one in a Beat down deck, but overall it compensates the shift of gears with lots of Synergy. 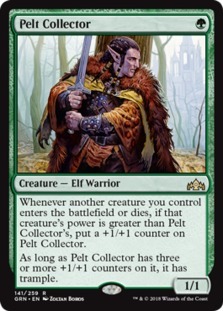 Pelt Colelctor: The creatures enter the battlefield with the counter on, so a Llanowar elves enters as a 2/2, Pelt collector can grow consistently into a 3/3 - 4/4 from my short experience. 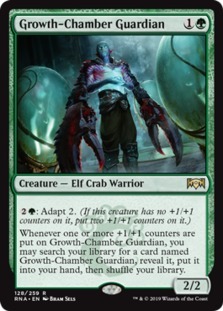 Growth-Chamber Guardian: Fetches for his brothers ETB! 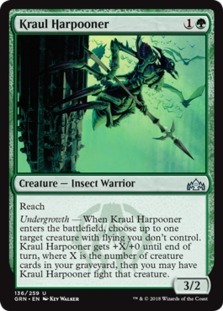 Kruul Harpooner: + Haste.... 5/2 -----8/2 haste 2 cmc! 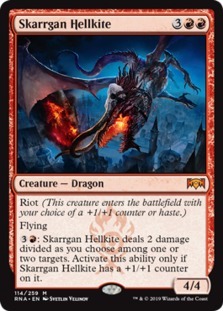 Skarrgan Hellkite: This is my new favorite red card.... this guy is amazing... just amazing every other Riot trigger just makes this guy overwhelming, and the mana sink can decimate boards in the late game or give you a little more of reach and a faster clock. 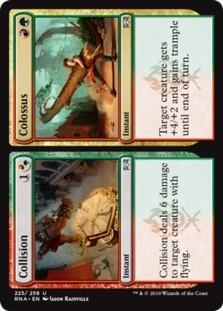 Lava coils seems very solid and I´m testing Collision//Colossus, trample is very much welcomed and getting rid of opposing Flyers is always good at 2 cmc. Been experimenting with something similar, but I don't have wildcards to spare on it atm. 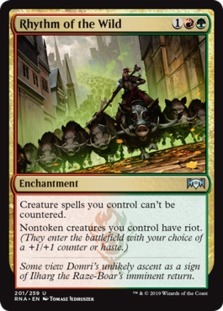 My thought was to try a red based gruul so that I could run Chainwhirler which seems strong against one of the decks weaknesses - spammy token decks - since rhythm helps a lot against the other weakness - heavy counter control+sweepers. 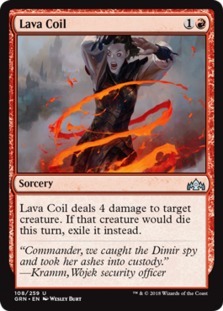 The issue being of course that I'd love to be running Lanowar Elf for the turn 2 Rhythm on the play. Not really progressed much with my thinking, but a test deck I threw together with the stuff I had did pretty well on ladder. 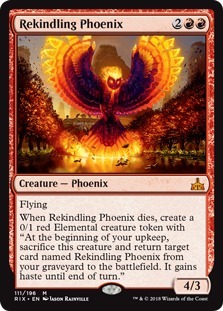 Not running Chainwhirlers though since I lack a lot of the needed lands. Zhur-Taa Goblin was ok, solid 3/3 on turn 2, pretty strong against red decks since they have to actually bolt the thing rather than shock. Not sure if that upside is enough to justify using them over Guardians, but they're a solid budget choice at least and if shock is a common thing to face - which it is atm - might just be a safer play..
Zhur-taa Goblin is very good indeed, there is also people running the full Explore package, in my list Kruul harponer has worked great, I did tried Zhur-taa a little bit, but it needs more testing. 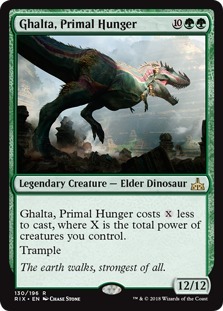 No matter what, your sideboard will want enough Warleaders and Rhythm to get them both to max, and probably a playset of Carnage Tyrant. Probably an extra forest if you are increasing your mana costs. And a burn package for fog decks. Tried the deck on the Bo1 ladder for a bit because I had a gruul quest, but I did not win anyting at all. Its winning a lot for me, against what you played? Might have been bad luck... I believe I faced RDW, mono W, control, and 1 or 2 others. Also 3-4 games in a row loss doesnt mean all that much but didn't feel like playing more with it afterwards.